Miskatonic River Press has a new book of essays about H.P. Lovecraft and the Cthulhu Mythos in the works with the awesome title Dissecting Cthulhu: Essays on the Cthulhu Mythos. It's being put together by Lovecraft critic and scholar S.T. Joshi, who says it will include well-known essays by Richard L. Tierney, Dirk W. Mosig, David E. Schultz, Robert M. Price, Will Murray, Robert D. Marten, Steven J. Mariconda, and others. The Cthulhu Mythos is H. P. Lovecraft’s most dynamic invention. His bold vision of a cosmos filled with baleful “gods,” forbidden books of occult lore, and a constellation of richly imagined New England cities was the perfect vehicle to express his “cosmic indifferentism.” The Mythos has become one of the most imitated tropes in horror literature, and hundreds of writers have made their own extrapolations on it. But many misconceptions remain about the Cthulhu Mythos. Its very name was not invented by Lovecraft, but by his disciple August Derleth. 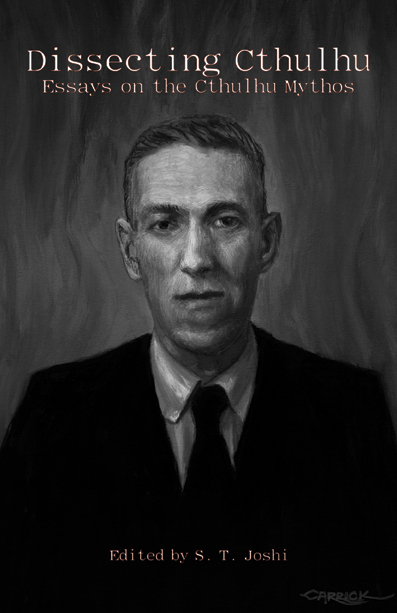 Derleth altered the Mythos in significant ways, and it is only recently that scholars and writers have returned to the purity of Lovecraft’s own vision. This collection of essays, gathered by pre-eminent Lovecraft scholar S. T. Joshi (Black Wings, The Rise and Fall of the Cthulhu Mythos, I Am Providence: The Life and Times of H. P. Lovecraft) prints many of the seminal essays on the Cthulhu Mythos, ranging from pioneering articles by Richard L. Tierney and Dirk W. Mosig that strip away Derleth’s misconceptions about Lovecraft’s pseudomythology, to penetrating studies by Robert M. Price, Will Murray, Steven J. Mariconda, and others probing key elements of the Mythos—its use of gods, books, and topography; the influences that Lovecraft absorbed in fashioning it; and its wide dissemination by generations of later writers. All told, this book provides an invaluable guide to Lovecraft’s most intriguing but most misunderstood creation. P.S. Did I mention that Dissecting Cthulhu is a brilliant title? This past week-end I recorded a 15 minute interview with S. T. on my YouTube channel, and the first book he mention'd was DISSECTING CTHULHU. The book is going to be all-reprints with many articles culled from the wonderful CRYPT OF CTHULHU, and it's going to be fascinating. I find that such commentary on the Mythos not only entertains me but feeds my crack'd brain with new ideas for Mythos fiction, new non-Euclidean approaches to writing Lovecraftian weird fiction. Can't wait for this awesome book! as the most important handbagreplica center of the stage, when hours, minutes, seconds here deductive years chasing the rotating flow. Asian Replica watches UK black dial is clearly visible, extraordinary quality brand exudes charm. Orange ornament on the time Replica handbags scale and pointer Mido is the most commonly used bright, deep black tone of the original, adding a little of Replica Watches the vigor and passion. After the hour and minute hands luminous orange Super-LumiNova? handle Rolex Dayton pointer. good the app very simple to utilize without containing https://itubedownloadapps.com on the web which provide you the schedule of iTube app. best.